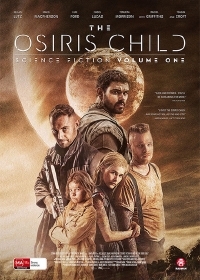 Shane Abbess is back with a pulpy new space opera called The Osiris Child: Science Fiction Volume 1. Rochefort loved the film out of Fantastic Fest last year and the first trailer looks like a ton of fun. You got to hand it to Abbess. He knows how to make a great looking product on a low budget. Set in the future in a time of interplanetary colonization, Sy (Kellan Lutz), a mysterious drifter, meets Kane (Daniel MacPherson), a lieutenant working for an off-world military contractor, EXOR. The film is seeing release in Australia first, followed by other territories. I don't think there is a clear date for US or Canada release, but we'll keep you all in the know. Bombastic and fun looks ...fun! For low budget it looks really good I like the FX and directing for the action scenes. I'll check it out! Looks good. The Aussies do a lot with little.